Carbon County is located in the southeastern area of Northeastern Pennsylvania. Philadelphia and the Lehigh Valley are in very close proximity to Carbon County. Interstate 476 & Interstate 80 passes through this County. State Route 209 is also an important roadway. Rail service is provided by Norfolk Southern. Carbon County is located in the Allentown-Bethlehem-EastonPA-NJ MSA. The economy of Carbon County is lead by the tourism and the hospitality sector. Carbon County is home to several large resorts and numerous other destination locations. Outdoor recreation activities range from snow skiing to white water rafting to hiking. The Lehigh Gorge State Park provides recreational adventures for outdoor enthusiasts. Over 2/3 of Carbon County is State Game Land and State Park Land. 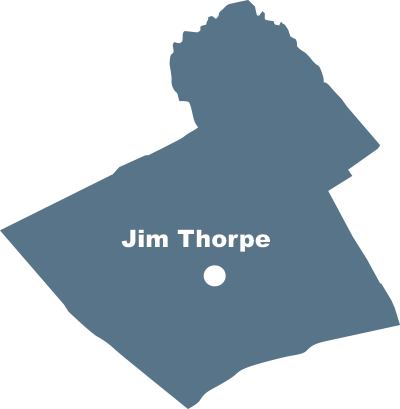 Jim Thorpe is a thriving tourism destination location with numerous events held year round. Industrial land is primarily located in Nesquehoning and Palmerton. Several large industries are located in Carbon County providing significant employment opportunities. Employment is concentrated in the tourism / hospitality; health care; manufacturing industry sectors.